Brest oblast. A southwestern province of Belarus, bordering on Ukraine in the south and Poland in the west. In the north and east it borders on other oblasts of the Belarus. It’s capital is Brest. 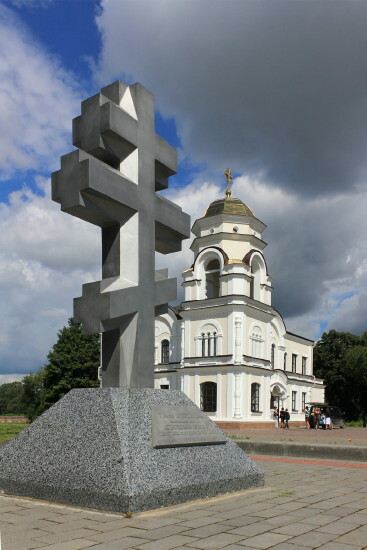 Brest oblast was formed on 4 December 1939. Its area covers 32,300 sq km, and its population in 2014 was 1,388,500. It is divided into 16 raions and has 21 cities and 8 towns smt. Although Brest oblast lies within Belarus, most of its territory is a part of Ukrainian ethnic territory. Of the 16 raions, 10 are essentially Ukrainian, 4 in the north are Belarusian, and 2 are mixed (ie, are divided by the Ukrainian-Belarusian ethnic border). The part of the oblast settled by Ukrainians covers about 20,000 sq km and has a population of over 900,000. The discrepancy between the Ukrainian-Belarusian political border and the ethnic border results from a deliberate decision made by the Soviet authorities. It is their policy to weaken the Ukrainian SSR and to reduce the size of the Ukrainian population, which is subjected to denationalization through both Belarusification and Russification in Belarus. Physical geography. Brest oblast lies on the border of Polisia, except for a small part in the northwest that belongs to Podlachia and a part in the northeast (settled exclusively by Belarusians) that belongs to the Belarusian Upland (Baranavichy Plain and Navahrudak elevation). The Ukrainian part of Brest oblast includes the following areas of Polisia: Buh Polisia, the western part of Prypiat Polisia, Zaiasoldia, Zarichia, and the somewhat more elevated Zahorodia. Except for Zahorodia, all these areas are wetlands. The highest elevation is 175 m, and the lowest is 110 m. The climate is temperate continental: the average temperature in July is 18–19°C, and in January it is –4.5°C (in the west) and –5.5°C in the east. The length of the growing season is 195–205 days. The annual precipitation is 550–650 mm, of which 400–450 mm fall in the warm season. The total length of the rivers is 5,000 km. The largest rivers are the Prypiat River and its tributaries the Yaselda River, Pyna River (connected to the Buh River through the Dnieper-Buh Canal and the Mukhavets River), Styr River, and Horyn River. There are many lakes, of which the largest are Vyhonivske Lake and Chorne Lake. The oblast has weakly podzolic sandy soils, podzolic turf loam, podzolic turf gley, and humus carbonate soils. Peat-bog soils constitute about 360,000 ha. Marshes cover 20 percent of the territory; of these, 93 percent are lowland bogs. The forests of Brest oblast are 54 percent pine, 18 percent birch, 18 percent alder, and 5 percent oak. 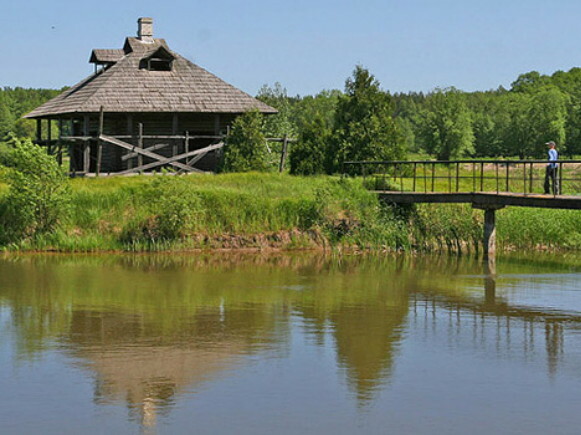 Bilovezha Forest lies within the oblast. History. Under the Polish-Lithuanian Commonwealth most of the present Brest oblast constituted Brest voivodeship of the Grand Duchy of Lithuania. After the partitions of Poland it became part of Hrodna gubernia within the Russian Empire. 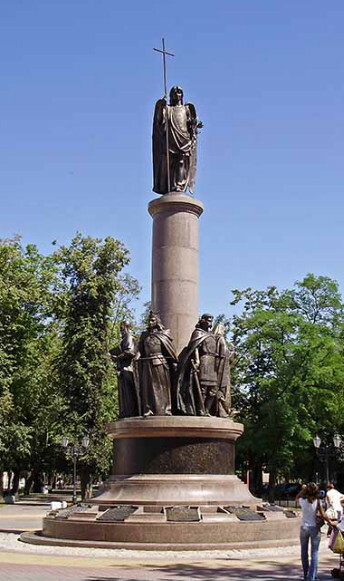 In 1917–19 the area was part of the Ukrainian National Republic. In 1920–39 under Poland it belonged to Polisia voivodeship. After 1939, retaining approximately the same boundaries, it became Brest oblast. (See also Berestia land). Population. In 2014 the population of Brest oblast was 1,388,500, resulting in a density of 42 people per square kilometer. The population density was highest in the raions with the largest cities—the Brest and Pynsk raions. In the First World War the front for a long time ran through the region, and there was a high loss of life during that war as well as during the Second World War. Owing to a high birth rate, the population bounced back quickly after the world wars. The oblast’s population was 1,225,000 in 1940, 1,182,000 in 1959, 1,294,000 in 1970, and 1,360,000 in 1979. The percentage of the urban population is constantly increasing: it was 17 percent of the population in 1940, 24 percent in 1959, 34.8 percent in 1970, and 42.1 percent in 1980. 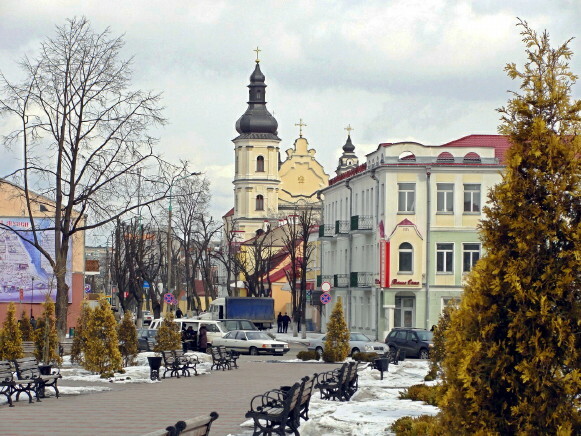 The largest cities in the province are Brest, with a population of 318,000; Baranavichy, with 168,900; Pynsk, with 131,200; Kobryn, with 51,300; Biaroza, with 29,600; Ivantsevychi, with 24,400; and Luninets, with 24,300. According to the census of 2009, the ethnic composition of the oblast’s population was: Belarusians, 1,221,880 (88 percent); Russians, 88,864 (6.4 percent); Ukrainians 40,266 (2.9 percent); Poles, 37,490 (2.7 percent). Economy. Until 1940 the economy of Brest oblast was predominantly agricultural. Lumbering also played an important role. Certain specific old farming methods were still employed (see Polisia). After the Second World War the oblast’s economy underwent basic changes because of the nationalization of agriculture and the growth of industry. Industry. In the present structure of industrial production the food industry (35 percent) and light industry (33 percent) predominate; they are followed by the metalworking industry (12 percent), the lumber industry and woodworking industry (8 percent), the peat industry, and the building industry. The energy produced is based on peat, natural gas (brought in by the Dashava–Minsk pipeline), and coal (from the Lviv-Volhynia Coal Basin). A huge 920,000 KW thermal power plant was built in Biaroza. The food industry consists of poultry- and meat-packing plants, fruit and vegetable canning plants, flour mills, sugar refineries, liquor distilleries, breweries, etc. The largest enterprise of light industry is the cotton textile mill in Baranavichy. There are also a rug factory, a hosiery factory, and a wool-textile factory in Brest and a knitted wear factory in Pynsk. Leather footwear is produced on a large scale. The metalworking industry and machine building developed only in the 1950s. They consist of an auto-repair plants and plants producing machine-tool instruments and equipment for commercial enterprises (in Baranavichy), gas equipment and electrical lamps (in Brest), and repair shops for boats and excavators (in Pynsk). The largest plants of the woodworking industry are the plywood and matchstick production complex in Pynsk, the ski factory in Telekhany, and the furniture factories in Brest, Baranavichy, and Pynsk. The main industrial centers of the oblast are Brest, Baranavichy, Pynsk, Luninets, and Kobryn. Agriculture. Farmland covers 1,482,700 ha, or 45.1 percent of the total land area of the Brest oblast: of the total land resources in the oblast, 25.2 percent is cultivated, 9.2 percent is hayfields, and 9.4 percent is pasture. Much of the farmland is swampy and requires draining; in 1978 drained farmland covered 497,400 ha. There were 855,500 ha under crops in 1978 (756,400 in 1965); of this, 402,500 ha (47.1 percent) were devoted to grain, 44,500 ha (5.2 percent) to industrial crops, 121,300 ha (14.2 percent) to potatoes, 6,600 ha (0.8 percent) to vegetable and melon crops, and 126,300 ha (14.8 percent) to fodder crops. Flax predominates among the industrial crops, covering an area of 24,555 ha. In 1975–8 the average yield (in centners per hectare) in Brest oblast was 25.0 for grains, 177.7 for potatoes, and 4.5 for flax. In 1979 there were 1,050,000 head of cattle (including 423,600 cows), 649,900 hogs, and 99,600 sheep in the oblast. Fishing, poultry farming, and beekeeping are also well developed. Transport. As of 1969 there were 1,050 km of usable railway in Brest oblast. The main lines are Moscow–Brest, Homel–Brest, and Vilnius–Rivne. The main railway junctions are Brest, Baranavichy, Luninets, and Zhabinka. The road transportation network is expanding rapidly, encompassing 10,500 km of highways, of which 3,300 km are hard-surface highways. Waterways, too, are extensively used, primarily the Prypiat River, Pyna River, Mukhavets River, Styr River, Horyn River, and Shar River and the Dnieper-Buh Canal. The trans-European Druzhba oil pipeline and the Dashava–Minsk gas pipeline run through the oblast.